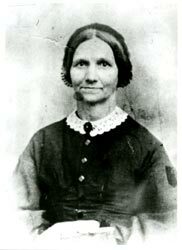 Chloe Aurelia Clarke Willson was born in Connecticut on April 16, 1818 and received her academic training at Wilbraham Academy, a seminary that specialized in training Methodist missionaries for service around the world. In 1839 Chloe Willson joined fellow Methodists on the ship “Lausanne” traveling to the Oregon Territory as part of the “Great Reinforcement” movement led by the Rev. Jason Lee. Soon after her arrival in the Northwest, Chloe Willson married fellow Methodist missionary, Dr. William Willson. After working at mission stations in the Puget Sound and the Willamette Falls, the Willsons moved to the Willamette Valley in 1844, where they became involved in the work of creating the educational community of Salem, Oregon. Chloe Willson became the first teacher at the Oregon Institute which was intended to educate the settler’s children. The Oregon Institute opened in August 1844 with Chloe Willson serving as both teacher and housemother for five primary grade students. Within two years the student body numbered twenty. Chloe Willson continued to teach at the Oregon Institute, subsequently named Willamette University, until 1847. After her husband’s death in 1856, Chloe Willson went back to Connecticut to put her daughters in school. While living there, Chloe Willson opened her home to students to help with expenses. In 1863 she returned to Willamette University where she served as the Governess of the Ladies Department for the next three years. In 1871 Chloe Willson moved to Portland, Oregon to live with her daughter, Frances, and son-in-law, Joseph Gill. Three years later Chloe Willson died, July 2, 1874. She is buried in the Pioneer Cemetery in Salem, Oregon, next to her husband. The Chloe Clarke Willson diary covers the years 1839 to 1849. The diary begins in late September, 1839 as Chloe prepared to leave on the journey to the Oregon Territory aboard the ship “Lausanne”. It covers in some detail the early stages of the trip. The first section of the diary ends in early February, 1840, three months before the end of the journey. The diary begins again in April, 1841, after she is married to William Willson. Entries in this section of the diary are less frequent and focus on the work she and William are doing. There are comments about interactions with the Native American tribes in the Washington and Oregon territories and her desire to help them. After the Willsons moved to the Willamette valley, Chloe Willson writes often about her teaching, her work with the youth of the area, including the founding of the Oregon Juvenile Temperance Society, and about how much she misses William when he is traveling. As a devout Methodist, Chloe Willson also uses her diary as a prayer journal. In this context she mentions attending “the first camp meeting held in Oregon,” and her desire for the “evil” of slavery to be destroyed.